I thought it would be fun to investigate a single celled organism and Amoebae seemed a good place to start, but boy, I really didn't know what I was getting into! To get around all the complexity and diversity, the Amoeba, Amoebidae and Amoebozoa, I've decided to focus primarily on one species, Amoeba proteus. They can be found at the bottom of clean ponds, anywhere in the world as far as I know, and seem like an all-round good place to start. One important point to note is the fact that amoebae can change shape. That's actually how they got their name, since "amoeba" comes from Greek meaning "change". In the case of A. proteus it's so important, they named it twice. Proteus is a Greek god who could tell the future but didn't actually want to. To escape this burden he could turn himself into a lion, a tree or even water, and some hero would have to hold him down the entire time to get his questions answered. Now, I don't think A. proteus has dramas and adventures of quite that sort, but they must still get around, escape danger, eat, and reproduce. It may seem strange for such tiny creatures to be concerned with this stuff, but then again some species of amoeba can be several millimetres long. In fact, large amoebae can be several times bigger than many insects. Does that make it less weird or more weird? So how does a blob of water or whatever get anywhere? Amoebae are actually composed of two different kinds of cytoplasm surrounded in a membrane to keep it all together. The cytoplasm is called a plasmasol when it is runny and liquid, but becomes the much firmer, jellylike plasmagel toward the edges. Amoebae extend pseudopods, or false feet, giving them the characteristic wibbly-wobbly sticky-out bits look.The liquid sol can then just flow into this pseudopod and turn into the gel when it moves toward the edge, which means that what had been gel turns into sol and starts pushing against the new gel, and so it continues. In the plasmasol are the various organelles, 'little organs' that are smaller than a cell, rather than made up of lots of cells like our own internal organs. The biggest is the nucleus, which is sort of like the brain or command centre, the action centre or perhaps more the reaction centre. A. proteus usually has one nucleus, but they can sometimes have several. It means they can pseudo-run away from dangerous acid, the sharp edges of salt crystals or more light than they find comfortable. When disturbed they can also roll into a ball shape with pseudopods extended in all directions, sort of like a star. A really tiny star. Or maybe a star exactly the same size as a star appears in the night sky to the naked eye. This allows them to float away, they're not too bothered about the star thing. 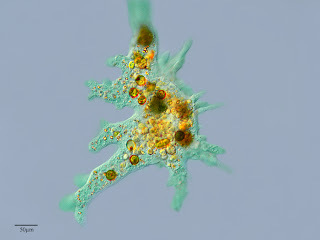 Pseudopods are also used in feeding, a process called phagocytosis. They extend two of them in opposite directions to form a circle around their food. This circle is very small around algae, which can't really get away, but it's a great big one around ciliates which could quickly swim to safety if they realised what was going on. Once captured, chemicals flow in for digestion and tasty stuff can be absorbed through the cell membrane and into the actual amoeba. Waste is deposited in a similar but opposite manner. And reproduction? Simply cell division. The nucleus splits in two with identical chromosomes on either side. Then the rest of the cell divides, creating two genetically identical amoebae. One interesting thing about A. proteus is that it has an absolutely gigantic genome, consisting of some 300 billion units of DNA, called base pairs. We humans have just 3 billion. Another one called Amoeba dubia has almost 700 billion base pairs! Who would think that tiny single celled organisms could have so much life to them?